Our Master of Business Administration (MBA) degree in Sustainable Solutions is for those who envision a more just, prosperous and sustainable world. Presidio Graduate School empowers students to become skilled and visionary leaders, change agents and entrepreneurs in any field or enterprise. 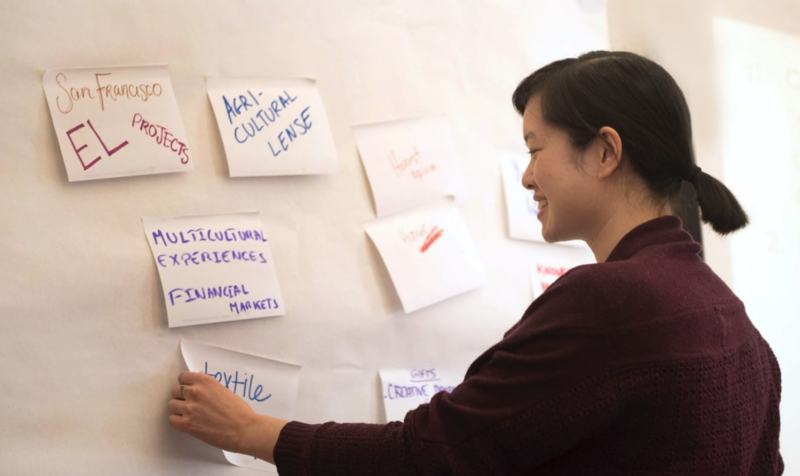 The most distinctive element of our programs is our signature integrated curriculum designed to connect rigorous management theory and practice with ecological and social awareness, systems thinking and sustainable leadership. Presidio Graduate School’s MBA programs prepare students to be skilled and visionary managers in any field or enterprise. Today’s business professionals must not only lead successful organizations but understand the many complex and interdependent issues that define sustainability, from climate change and clean tech to stakeholder engagement and social responsibility. Our MBA degrees connect rigorous management theory and practice with ecological and social awareness, systems thinking and sustainable leadership. Our curriculum weaves these elements together to empower our students to become effective leaders, change agents and entrepreneurs in the service of a more just, prosperous and sustainable world. Presidio Graduate School graduates thrive because today’s successful business professionals must not only lead organizations but understand the many complex and interdependent issues that define sustainability. From climate change and CleanTech to stakeholder engagement and social responsibility, there are new skills and new mindsets that are crucial to ensuring a more just, prosperous and sustainable world. We define competence in Sustainable Management as a working mastery of these three fundamental concepts. The PGS MBA program is a 45-credit curriculum with 9 required courses and three electives. The program combines face-to-face classroom experience with the flexibility of interactive distance-learning. Students have as much in-class time as a traditional MBA program. However, PGS provides an additional level of learning through a robust online component that develops essential management skills and facilitates virtual collaboration among students. Each semester, classroom instruction takes place over a four-day residency period (part-time students attend classes for two days). These residencies occur Thursday through Sunday once a month for five months. Presidio Graduate School’s MBA program prepares students to be skilled and visionary managers in any field or enterprise. Today’s business professionals must not only lead successful organizations but understand the many complex and interdependent issues that define sustainability, from climate change and clean tech to stakeholder engagement and social responsibility. Our MBA degree connects rigorous management theory and practice with ecological and social awareness, systems thinking and sustainable leadership. Our curriculum weaves these elements together to empower our students to become effective leaders, change agents and entrepreneurs in the service of a more just, prosperous and sustainable world.